A collection of three articles giving you a more realistic picture as to what has really happened and what we should expect coming after the lynching and murder of Muammar al-Gaddafi.The third and probably the most important one is from voltaire. Who really started the war in Libya? And why? Read this! The names change but the methods remain the same. In Iraq the imperial war facilitator was Ahmed Chalabi. In Libya he goes by the name of Soliman Bouchuiguir, a shadowy human rights figure whose baseless allegations against Gaddafi were endorsed by the UN system and its affiliated human rights agencies without the slightest verification. Each one in his own way, Nazemroaya and Teil shed light on a failed system of international law and justice, which has made itself complicit in NATO’s war crimes in Libya. One of the main sources for the claim that Qaddafi was killing his own people is the Libyan League for Human Rights (LLHR). The LLHR was actually pivotal to getting the U.N. involved through its specific claims in Geneva. On February 21, 2011 the LLHR got the 70 other non-governmental organizations (NGOs) to send letters to President Obama, E.U. High Representative Catherine Ashton, and the U.N. Secretary-General Ban-ki Moon demanding international action against Libya invoking the “Responsibility to Protect” doctrine. Only 25 members of this coalition actually assert that they are human rights groups. - Call for the General Assembly to suspend Libya’s Council membership, pursuant to Article 8 of Resolution 60/251, which applies to member states that commit gross and systematic violations of human rights. - Strongly condemn, and demand an immediate end to, Libya’s massacre of its own citizens. - Dispatch immediately an international mission of independent experts to collect relevant facts and document violations of international human rights law and crimes against humanity, in order to end the impunity of the Libyan government. The mission should include an independent medical investigation into the deaths, and an investigation of the unlawful interference by the Libyan government with the access to and treatment of wounded. - Call on the UN High Commissioner of Human Rights and the Council’s relevant Special Procedures to closely monitor the situation and take action as needed. - Call on the Council to remain seized of the matter and address the Libyan situation at its upcoming 16th regular session in March. The letter’s signatories included Francis Fukuyama, United Nations Watch (which looks out for Israel’s interests and according to Israeli sources organized the entire session against the Libyan Arab Jamahiriya),  B’nai B’rith Human Rights Commission, the Cuban Democratic Directorate, and a set of organizations at odds with the governments of Nicaragua, Cuba, Sudan, Russia, Venezuela, and Libya. Some of these organizations are viewed with hostility as organizations created to wage demonization campaigns against countries at odds with the U.S., Israel, and the European Union. Refer to the annex for the full list of signatories for consultation. LLHR is tied to the International Federation for Human Rights (FIDH), which is based in France and has ties to the National Endowment for Democracy (NED). FIDH is active in many places in Africa and in activities involving the National Endowment for Democracy in the African continent. Both the FIDH and LLHR also released a joint communiqué on February 21, 2011. In the communiqué both organizations asked for the international community to “mobilize” and mention the International Criminal Court while also making a contradictory claiming that over 400 to 600 people had died since February 15, 2011. This of course was about 5,500 short of the claim that 6,000 people were massacred in Benghazi. The joint letter also promoted the false view that 80% of Qaddafi’s support came from foreign mercenaries, which is something that over half a year of fighting proves as untrue. According to the General-Secretary of the LLHR, Dr. Sliman Bouchuiguir, the claims about the massacres in Benghazi could not be validated by the LLHR when he was challenged for proof. When asked how a group of 70 non-governmental organizations in Geneva could support the LLHR’s claims on Geneva, Dr. Buchuiguir has answered that a network of close relationships was the basis. This is a mockery. The claims of the Libyan League for Human Rights (LLHR) were coordinated with the formation of the Transitional Council. This becomes clear when the close and cagey relationship of the LLHR and the Transitional Council becomes apparent. Logically, the Obama Administration and NATO had to also be a part of this. Whatever the Transitional Council is and whatever the intent of some of its supporters, it is clear that it is being used as a tool by the U.S. and others. Moreover, five members of the LLHR were or would become members of the Transitional Council almost immediately after the claims against the Libyan Arab Jamahiriya were disseminated. According to Bouchuguir individuals with ties to the LLHR or who hold membership include Mahmoud Jibril and Ali Tarhouni. The economist Ali Tarhouni on the other hand would become the minister for oil and finance for the Transitional Council. Tarhouni is Washington’s man in Libya. 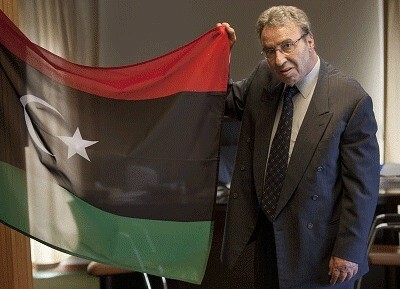 He was groomed in the United States and was present at all the major meetings about plans for regime change in Libya. As Minister of Oil and Finance the first acts he did were privatize and virtually handover Libya’s energy resources and economy to the foreign corporations and governments of the NATO-led coalition against Libya. Bouchuguir’s analytical thesis reflects an important line of thinking in Washington, as well as London and Tel Aviv. It is both the embodiment of a pre-existing mentality, which includes U.S. National Security Advisor George F. Kennan’s arguments for maintaining a position of disparity through a constant multi-faced war between the U.S. and its allies on one hand and the rest of the world on the other hand. The thesis can be drawn on for preventing the Arabs, or others, from becoming economic powers or threats. In strategic terms, rival economies are pinned as threats and as “weapons.” This has serious connotations. It is also clear that Reich is tied to Israeli interests. He has even written a book about the special relationship between the U.S. and Israel. He has also been an advocate for a “New Middle East” which would be favourable to Israel. This includes careful consideration over North Africa. His work has also focused on the important strategic interface between the Soviet Union and the Middle East and also on Israeli policy in the continent of Africa. It is clear why Bouchuiguir had his thesis supervised under Reich. On October 23, 1973, Reich gave a testimony at the U.S. Congress. The testimony has been named “The Impact of the October Middle East War” and is clearly tied to the 1973 oil embargo and Washington’s aim of pre-empting or managing any similar events in the future. It has to be asked, how much did Reich influence Bouchuiguir and if Bouchuiguir espouses the same strategic views as Reich? A “New Africa” is in the works, which will have its borders further drawn out in blood like in the past. The Obama Administration and its allies have opened the gateway for a new invasion of Africa. United States Africa Command (AFRICOM) opened the salvos of the war through Operation Odyssey Damn, before the war on Libya was transferred to NATO’s Operation Unified Protector. The claims of the Libyan League for Human Rights (LLHR) were never supported or verified. The credibility of the United Nations must be questioned as well as the credibility of many humanitarian and human rights organizations that have virtually pushed for a war. At best the U.N. Security Council is an irresponsible body, but it has clearly acted outside of due legal process. This pattern now appears to be repeating itself against the Syrian Arab Republic as unverified claims are being made by individuals and organizations supported by foreign powers that care nothing for authentic democratic reforms or liberty. - Glenn P. Johnson, Jr., Treasurer,　Victims of Pan Am Flight 103, Inc.,　father of Beth Ann Johnson, victim of Lockerbie bombing. United Nations Watch et al., “Urgent Appeal to Stop Atrocities in Libya: Sent by 70 NGOs to the US, EU, and UN,” February 21, 2011. Physicians for Human Rights, “PHR and Human Rights Groups Call for Immediate Action in Libya,” February 22, 2011. Global Research Editor’s Note: U.N. Watch which actively promoted the LLHR statement has informal ties to the U.S. State Department. It was established during the Clinton Administration in 1993 under the Chairmanship of Morris B. Abram, a former U.S. Permanent Representative to the United Nations in Geneva. U.N. Watch is formally affiliated with the American Jewish Committee (AJC), a powerful pro-Israeli political lobby organization based in New York City. The International Federation for Human Rights (FIDH) and the Libyan League for Human Rights (LLHR), “Massacres in Libya: The international community must urgently respond," February 21, 2011. Jim Garamone, “Africa Command Learns from Libya Operations American Forces Press Service, September 15, 2011. Gregory Miller and Craig Whitlock, “U.S. assembling secret drone bases in Africa, Arabian Peninsula, officials say,” The Washington Post, September 20, 2011; Julian E. Barnes, “U.S. Expands Drone Flights to Take Aim at East Africa,” The Wall Street Journal (WSJ), September 21, 2011.
thanks for the updates, it's nice to know how libya is doing without gaddafi.